The Mogao Caves are a system of 492 rock-cut cells and sanctuaries near Dunhuang, in the desert landscape of Gansu Province. Because of its strategic position along the Silk Route, the caves attracted many pilgrims and a variety of cultural influences from the 4th until the 14th century. The complex once held over 1000 caves with rock art. About 40 of them date from the Northern Wei-dynasty (385-557). More were added during the Sui-dynasty (581-618). Most of the caves were made during the Tang-dynasty (until ca. 750), when Buddhism and the Silk Route were in their prime. The caves were made a WHS because of the artistic achievement (statues and wall paintings), the cultural exchange they represent and the Buddhist monastic history. 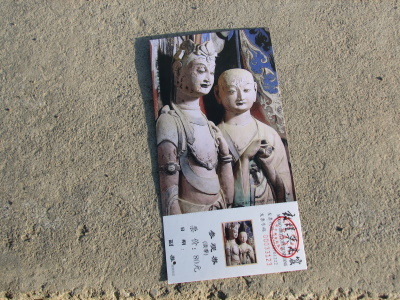 The Mogao Caves are located in a little oasis just outside Dunhuang city. I arrived at 2.30 p.m. and had to wait until a small group had gathered. I forgot to ask about an English speaking guide at the ticket booth which is about 1 kilometer away from the cave entrance. So I ended up with a Chinese tour, with 11 other visitors. Photographing is not allowed. The tour took us to nine of the caves plus the Hidden Library exhibition. The caves we visited included the two large buddhas, the reclining buddha and examples of Wei and Tang dynasty carvings. The story of the Hidden Library, and how its contents were first given away by its discoverer Wang Yuanlu and later 'bought' by non-Chinese explorers (British, American, Russian and Japanese) plays a prominent role in the tour. I got the feeling that the extremely strict visiting rules of today are a compensation for this past abuse. This was my final visit of the four groups of buddhist rock art in China (Dazu, Longmen and Yungang were the others). The Mogao Caves are the oldest of these four, and differ from the others because of their elaborate wallpaintings and decorated floors. My feelings about visiting Mogao are a mixture of these described below by Paul Tanner and Renae in their reviews. Visiting out-of-season and in the late afternoon is definitely a plus. Also the tours now all take two hours and have good guides, which is good value for the 80 Yuan entry fee (100 Yuan if you want a guide in a foreign language). But, there is a but, I only got to know the immensity of this site after I bought a book about them, and got to see what is in all the other caves. The tour does give you a good sample of the styles, but the wealth behind these doors must be overwhelming. I didn't leave Mogao with the same Wow-feeling that I had in Dazu and Yungang where everything is out in the open and for all to see. We came to Dunhaung to visit the Mogao caves as part of our silk road journey. We were very deceived by the management approach that is ongoing here and decided not to visit this heritage site. The primary reason being the excessive access fee (240 yuans for foreign tour, 220 for chinese guide). There is a museum (research and exhibition center) that was accessible before may 8 and it could be visited without paying a visit to the real caves. However, this basic ticket is no longer available and this is a shame. By making not making available such a visit, the management is not helping at all protecting the actual caves which would probably benefit form having less tourists inside the actual caves (actually, the amount of caves that can be visited have been gradually decreasing for years). The management approach as well as the high access fee to the site are questionable and definitely need some rethinking. I visited the Mogao Cave site with my husband and daughter just last month as part of our 31 day drive from Shanghai to Xinjiang and back. It was the middle of summer and very, very crowded - I guess with such a famous site that is to be expected. The caves themselves were fascinating and it certainly helped to have purchased a book in advance so we knew a bit about what we were going to see. However, our overall experience was very like the one Paul Tanner and his group had. After living and travelling in China for the last 13 years we consider ourselves to be experienced China travellers who are used to the challenges of China but Mogao Caves was a tough day for us. A few years ago it was very common for tourist sites to charge different prices to foreigners but Mogao Caves is the only place we have come across in many years that still does it. I can't help wondering at the uproar is would cause if Chinese tourists who visited Western countries were asked to pay a completely different price just because they were Chinese? After quite an argument about not paying the "extra" fee just because we were foreign it was decided that we could join a local tour. This meant the guide only spoke in Chinese. This was fine for my husband and daughter but I missed a lot of the stories the guide told because of all the specific Buddhist language she used so I wouldn't recommend this option unless you are really fluent. Although the tour guide was very knowledgeable she clearly did not enjoy her job and we were disappointed that she rushed through, huffing and puffing if anyone dared to ask a question. We were also surprised at how few caves we were actually able to visit. At the end of the tour we expressed our disappointment and she kindly suggested that we remain inside the complex and enter caves that were open because another tour group was inside. This was a good suggestion and we were able to see a much larger number of caves just by walking into any cave where the doors were open. We did not have the special ear piece anymore but stood to the side of the main group and used the book we had purchased in the gift shop to read about the special features of the cave. The day before we had visited the West Thousand Buddhas Caves and had a much better experience. We were the only visitors, the guide was delighted to have us and he gave us an excellent tour explaining a great deal about the history and art of the caves. If you are going to Dunhuang and have a few days I recommend visiting the West Thousand Buddha Caves before your trip to Mogao. I went to the Mogao Grottoes more than years ago, and I wish I had paid more attention to it, because it surely was one of the best places I had ever visited. The paintings and artworks were fabulous, to say the least, unfortunately I hadn't quite grasped their historical significance back then. The tour group my family was travelling with could all speak and understand Chinese quite well, but the guides in general are not very helpful and tend to rush their speeches through, especially when speaking in Chinese. The many historical words associated with the cave did not make my understanding very much clearer either. But I did love the artworks in the cave, and wish I could have taken some photos, or had time to do some sketches. The sculptures are truly enormous and awe-inspiring, as well as the huge caves covered from floor to ceiling with the most colourful murals. It's amazing how the paint has managed to even retain colour through the centuries; much of the artworks of bygone eras have faded beyond redemption! We went in autumn, the only season where non-locals could possibly survive (Dunhuang is located in a scorching desert which freezes over each night) so with that season being the most popular tourist season, it was rather crowded, however tours were spaced well apart to give each group some private viewing time and not have to all cram into a single cave. There were maybe 2 or 3 groups in a cave/ temple at one time, which isn't so bad perhaps, comparing those numbers to what you might get in a palace room at the Forbidden city at ANY given time. Then again, seeing some of the smashed and vandalised paintings made me quite sad, remembering the atrocities foreigners have committed on Chinese soil. Seriously, I'm not trying to offend anyone personally, but none of the eight countries were very kind about their relations with China. Sections of cave walls had been torn off completely, and while I shudder to think of what could have happened to it, it's probably in London or the Louvre somewhere. I guess the Mogao Caves are not only a representation of Buddhist art and culture, it is also a reminder of some uglier events of modern history. But while this train of thought is quite gloomy, it helps remind one that such beauty is a fragile and delicate thing, but can still shine after a thousand years of existence. When one writes a WHS review there is perhaps a feeling that one needs to emphasise what a great experience the visit was – after all one put a lot of time, effort and money into getting there! The Mogao Caves however provided what must be one of the worst “viewing experiences” of the 400+ WHS we have seen to date! We have travelled in China 5 times, 4 of these independently, and to most areas, so are experienced in the frustrations and difficulties of a Westerner trying to see that country – the crowds, the hassle, the rip-offs, the shrug of the shoulders accompanied by “mei banfa” (“there’s no way”) to show that the person you are dealing with “doesn’t give a damn” etc - but recognise that there are many compensations too! In 1996 we were crossing from Islamabad to Beijing along the “Silk Road” and had reached the oasis of Dunhuang, the nearest town to the Mogao caves. In front of the site was a vast car park with hundreds of minibuses and crowds of people. Only groups are allowed inside and, as 2 foreigners, we had to wait for ages in a room until a few more people of various nationalities had congregated. We paid the large differential charges for foreigners and were then rushed through a few caves by a poor guide. No photos were allowed inside the fenced area – ie not just inside the caves themselves (which is not unreasonable to spare the paintings from flash deterioration – but one can’t avoid the feeling that it is more to save the postcard monopoly!). Many of the best caves were closed, only available at an extra fee or to VIPs. The others were incredibly crowded – and there can be few things noisier than a crowd of Chinese in a cave! I can honestly say that I remember little of the “fabulous art” on display! Now, we fully appreciate that WHS sites are not on the list purely for tourists to visit and there is no doubt that the Mogao caves justify their inscription for their art, manuscripts and what they represent historically. The story of how they were “rediscovered” in 1907 and how the “perfidious” British (originally Hungarian) archaeologist Aurel Stein persuaded the simple monk Wang to allow 1000s of the most valuable manuscripts to be spirited away (and was followed a year later by a Frenchman before the Chinese government stopped the transactions) is the stuff of archaeological legend. Look on the British Museum Web site under “Mogao” and you will see just how much they still have – including the “Diamond Sutra”, the World’s oldest dated “printed” book. But our mindset and the circumstances of the visit perhaps detracted from our appreciation of what we saw. I fully admit to not finding Buddhist art particularly enthralling – yet another cave full of paintings of Bodhisattvas and Apsaras! I rather shamefacedly admit to a similar feeling in western museums such as the Uffizi on entering a room full of paintings of fleshy cherubs – all very nice and colourful but does it really do anything for me? The desert cliff-side location of Mogao could/should provide atmosphere and help one imagine this place in the 4th century when it was on the trade route by which Buddhism ENTERED China (think of Bamiyan in pre-Islamic Central Asia)! Despite their rip-off prices to foreigners the Chinese make no attempt to present the place in a historical or artistic context. We had already seen other caves from this movement at Bezeklik near Turpan. These are in a more impressive setting albeit that the art inside them is in no way comparable. Manichaeism: "a moderate number of Manichean, mainly Chinese texts (the Hymn Scroll, the Traité manichéen, that is, the "Sermon on the Light Nous, and the Compendium of the Doctrine of Mani") discovered in the book deposit in cave 17"
Isolated WHS: Roughly 1,025 KM from Orkhon Valley Cultural Landscape. Global Geoparks: Dunhuang (2015): "The Geopark also encompasses the Mogao Caves,.."
67 Community Members have visited.